[By Nick, New for 2015] ‎Dubba has already covered one of these fancy new froyos from Kemp so it's my turn to see what they're all about. He took the most appealing option to me but hey, I'm all for reviewing something when peanut butter is involved. This line reminds me far too much of Breyer's Gelato line in appearance. It's the standard base with something swirled into it and then a topping to make it all look pretty. Thankfully that similarity ends there because Kemps is putting out a quality product. 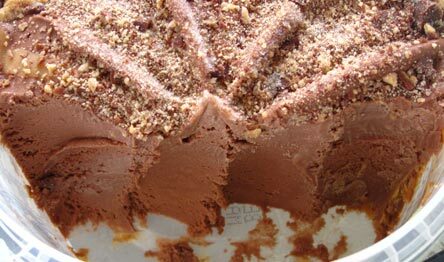 Here we have a dense, creamy chocolate frozen yogurt that reminds me more of ice cream than froyo. It's more on the milk quality side and it's rather enjoyable on its own. 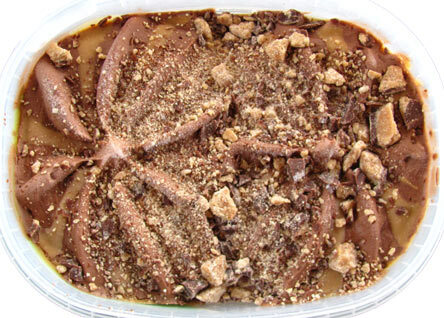 The peanut butter cup topping is basically Reese's peanut butter cups that have been turned into gravel. It tastes like the classic combo but most of it is too tiny to give much of the texture you'd get from biting into a regular pb cup. The peanut butter "swirls" (filled in on top and also injected in to the base) are as expected and how you'd want them to be. They aren't rock hard or too gooey. Rather they're solid with some pliability to them. The flavor tastes like peanut butter straight from the jar which is never a bad thing. It could've used a tad bit more saltiness to it because it is rather sweet especially with the already sweet base going on. The problem with these things are that you have to eat them by taking all layers at once or you're left missing the complete experience. I wish they would throw some of the topping into the base as well because there's not enough of it on the top alone. If they want us to eat it like a parfait, add another layer of the toppings and these would be a hit for me. As is, I've had better peanut butter/chocolate combos and the novelty of this just isn't enough to warrant another purchase. Don't get me wrong, the taste is great but they're not reinventing the wheel. I need some sort of wow factor to separate this from the competition and this just doesn't have it. I'll be sure to try out the others from the line though. Chunks of peanut butter cups should be there. Mini and broken up peanut butter cups! Alek, there are like a handful of real chunks on the top as you can see. Just not enough to actually play much of a factor. Did they make their own peanut butter cups? Stride, not too many companies use their own mix-ins. I'm sure they sourced them from somewhere else but they're not a name brand peanut butter cup or they'd mention it on the packaging.